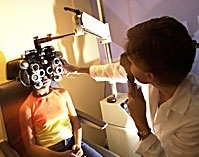 Periodic eye and vision examinations are an important part of preventive health care. Many eye and vision problems have no obvious signs or symptoms. As a result, individuals are often unaware that problems exist. Early diagnosis and treatment of eye and vision problems are important for maintaining good vision and eye health, and when possible, preventing vision loss. A comprehensive adult eye and vision examination may include, but is not limited to, the following tests. Individual patient signs and symptoms, along with the professional judgment of the doctor, may significantly influence the testing done. A patient history helps to determine any symptoms the individual is experiencing, when they began, the presence of any general heath problems, medications taken and occupational or environmental conditions that may be affecting vision. The doctor will ask about any eye or vision problems you may be having and about your overall health. The doctor will also ask about any previous eye or health conditions of you and your family members. When testing distance vision, the top number in the fraction is the standard distance at which testing is done, twenty feet. The bottom number is the smallest letter size you were able to read. A person with 20/40 visual acuity would have to get within 20 feet of a letter that should be seen at 40 feet in order to see it clearly. Normal distance visual acuity is 20/20. This test measures the curvature of the cornea, the clear outer surface of the eye, by focusing a circle of light on the cornea and measuring its reflection. This measurement is particularly critical in determining the proper fit for contact lenses. Refraction is conducted to determine the appropriate lens power needed to compensate for any refractive error (nearsightedness, farsightedness, or astigmatism). Using an instrument called a phoropter, your optometrist places a series of lenses in front of your eyes and measures how they focus light using a hand held lighted instrument called a retinoscope. 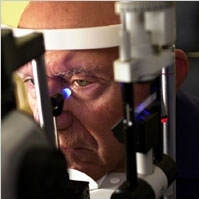 The doctor may choose to use an automated instrument that automatically evaluates the focusing power of the eye. The power is then refined by patient's responses to determine the lenses that allow the clearest vision. This testing may be done without the use of eye drops to determine how the eyes respond under normal seeing conditions. In some cases, such as for patients who can't respond verbally or when some of the eyes focusing power may be hidden, eye drops are used. The drops temporarily keep the eyes from changing focus while testing is done. Assessment of accommodation, ocular motility and binocular vision determines how well the eyes focus, move and work together. In order to obtain a clear, single image of what is being viewed, the eyes must effectively change focus, move and work in unison. This testing will look for problems that keep your eyes from focusing effectively or make using both eyes together difficult. External examination of the eye includes evaluation of the cornea, eyelids, conjunctiva and surrounding eye tissue using bright light and magnification. Evaluation of the lens, retina and posterior section of the eye may be done through a dilated pupil to provide a better view of the internal structures of the eye. 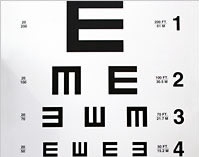 At the completion of the examination, your optometrist will assess and evaluate the results of the testing to determine a diagnosis and develop a treatment plan. He or she will discuss with you the nature of any visual or eye health problems found and explain available treatment options. In some cases, referral for consultation with, or treatment by, another optometrist or other health care provider may be indicated. If you have questions regarding any eye or vision conditions diagnosed, or treatment recommended, don't hesitate to ask for additional information or explanation from your doctor.